Baby - This week my little girl is about the size of a large mango (11.5 inches) and is now weighing in to be about 1.1 pounds! This week she is more proportioned in relation to the size of her head compared to the size of her body. She now looks much more like a tiny version of a newborn baby! Her skin however is still translucent and if you looked inside you would be able to see all her organs underneath, which seems both amazing and slightly scary. Her eyes are also now fully formed, they are only missing their colour now. Me - This week has been hard when it has came to my itching. On the Thursday of week 22 I had my blood test for liver functions repeated. For the whole week before that I was itching like crazy. By Thursday night I had the result, my bile acids had jumped from being a very normal 4 to being at 111! I was asked to go up to the hospital that night and pick up some medication that the doctors wanted me to start taking immediately and to attend the next morning to speak to the doctor. It was at that appointment that I was diagnosed with having early on set obstetric cholistasis which you can read all about by clicking on the link. After 2- 3 days I started to really get some relief from the itching! At last. It certainly wasn't gone by any means but it was much less intense and I wasn't wanting to pull my hair out any longer. This week I have been feeling a fair bit more movement and she is certainly starting to get herself into a little pattern every day of when she moves around and her stronger movements all mostly happen at night. I love feeling her little kicks and movements now and she can still surprise me every now and then which always makes me smile. I have started to notice that if I am sitting down at night I can see her big kicks and movements making my tummy move around, I have been attempting to catch this on camera but I am yet to be successful! Baby - At 24 weeks baby is measuring to be around the same size as corn (12.5 inches) and now weighs around 1.25 pounds. This week she is developing her senses which means she can most likely now tell if she is upside down! I have noticed that she spends a lot more time kicking my pelvis this week rather than her usual area which would be around the middle of my tummy. Her ears are now much more developed and she can start to tell the difference between sounds. She can now hear my heartbeat and my voice which is pretty cool! She is also quickly developing her respiratory system which will allow her to be able to practice breathing using the amniotic fluid! Me - My blood results from my Thursday appointment to keep track of my obstetric cholistasis have shown that my bile acids are down by a lot! They are now sitting at 24 which is much better than they had been. I am feeling a lot better when it comes to the itching. I no longer feel incredibly self-conscious about being outside and itching all the time. I was really worried that people would think I had chicken pox or something else! This week I have managed to really enjoy some time to relax which has been hard so far during this pregnancy. Between having D to run around with, trying to keep up with everything that has needed done around the house and all of the appointments I have had along with not actually being able to do things due to feeling so ill and the limits of time. 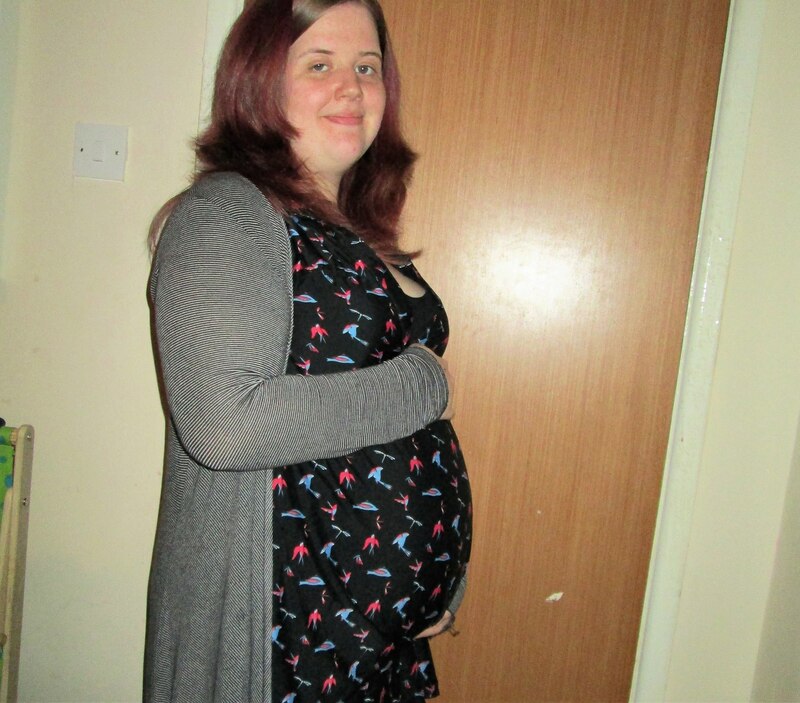 I have started to really notice my bump now and on many occassions this week I have noticed I will touch or hold my bump without even realising. I am starting to feel pretty big at this point and I know I will only get bigger from here on out! I feel like even though so much has happened medically speaking during this pregnancy that I should really be frustrated. That is not how I feel, yes I have had moments where I felt like the whole pregnancy has been a disaster but I am really enjoying being pregnant this time round. While I was pregnant with D I don't think I really did enjoy it as much as I should have. I remember feeling awkward and tired for most of my pregnancy with D which looking back now I realise I had it rather easy! Towards the end of this week I did manage to catch tonsillitis! For the first time ever, which is pretty amazing considering both D and Simon get it at least once a year. This week I have started to really crave ice in all forms! The one thing I really do love at the moment is slush puppies and ice pops. I have yet to reach the amount I remember consuming with D but I am certainly wanting them on at least a daily basis! I have started to really enjoy all things that are spicy at the moment which is a bit strange as I would usually prefer to have things that are much blander and have very little spice.